Found in brackish to marine waters around Kuwait to Fiji, north to southern Japan, south to New Caledonia. Also reported from Samoa, Tonga, and the Society Islands. Good brackish community fish, but grows large and should not be kept with smaller species. Can be aggressive so should only be kept with similar-sized robust tank mates who prefer similar water chemistry. Will eat most foods including pellet and flake. Provide a varied diet, to include some vegetable matter such as blanched vegetables and spirulina. Feed often, every day, either once or twice a day. These fish are brackish and should be kept at a SG of at least 1.010; adults can live in marine water. When they are young they will tolerate relatively low salinity, this salinity needs to increase as they mature. Their tank should be large and well filtered as well as providing plenty of open swimming space. Sturdy hiding places are preferable also. A fairly active, shoaling species with a greedy appetite. Compressed vertically, with a high back in adults. 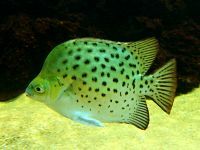 Many spotted markings on the fish, sometimes forming stripes, especially in younger specimens. There is a doubtful subspecies, being S. argus rubrifrons, which only slightly varies in colouration.